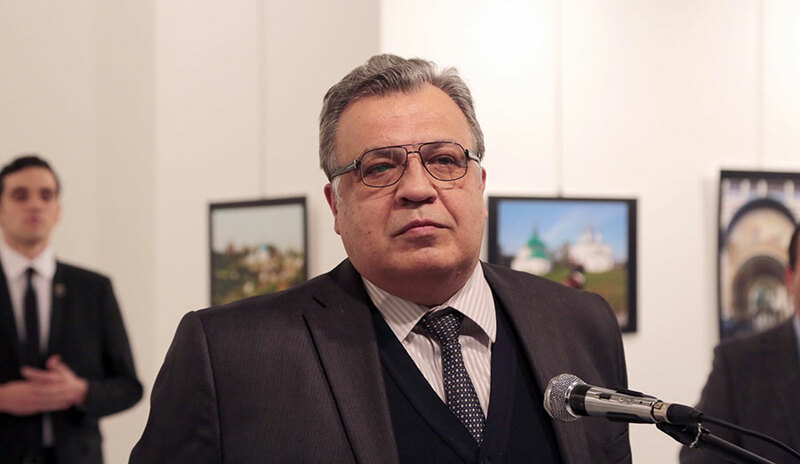 This Monday Andrei Karlov, the Russian Ambassador to Turkey since 2013, was shot to death in an art gallery in what the Russian Government called a terrorist attack. The event took place at the Contemporary Arts Center in the Cankaya area of Ankara, where Mr. Karlov spoke to the press before the attack. While he was in the middle of the speech, the hitman shot Karlov from behind about eight times, according to the video of the shooting. According to the witnesses and video footage, the killer started shouting “Allahu Akbar!”(God is great) and “don’t forget Aleppo, don’t forget Syria!”. The man said those things in English before he started speaking in Turkish. “Don’t forget Aleppo. Don’t forget Syria. Unless our towns are secure, you won’t enjoy security. Only death can take me from here. Everyone who is involved in this suffering will pay a price,” screamed the gunman. 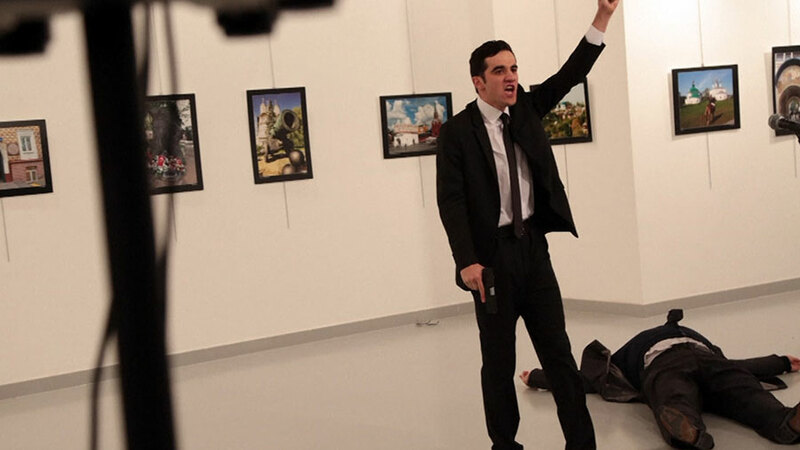 The Russian Foreign Ministry confirmed the assassination of the envoy while acknowledging the act as a “terrorist attack.” According to the Ankara mayor, Melih Gökçek, the gunman was a member of the local police department. Reuters reported that the man was not on duty while he was at the Arts Center. The footage of the event shows how the gunman, dressed in a black suit and tie, stood next to the ambassador while he gave the scheduled speech. In the middle of it, the man started shooting at Karlov. Moments after the local law enforcements officers arrived and exchanged gunfire, the gunman was later killed. While this happened, the attendants to the gallery took cover in adjacent rooms. Karlov is the first Russian envoy to be killed since 1927, when Pyotr Voykov, a Soviet ambassador to Poland, was shot to death in that country. Mr. Karlov had been in the diplomatic world since 1976, primarily working in both North and South Korea for over 20 years. He returned to Europe in 2007 and took the job in Turkey in 2013. According to experts, this situation comes at the worst time possible. Both Moscow and Ankara just recovered stable diplomatic relationships after the incidents that occurred last year. Back in November 2015, the Turkish military forces shot down a Russian Jet while it was flying near the border between Syria and Turkey. The allegations from the Turkish army are that the Russian plane flew within the Turkish territory, and even warned the aircraft’s crew through an emergency channel. 17 seconds after the jet entered Turkish airspace it was fired and knocked down to the ground. The Russian President Vladimir Putin said that the plane was in Syrian territory and that this attack was unjustified. These declarations were backed by the Russian Defense Ministry when it stated that the aircraft stayed in Syria all the time and that the crew didn’t receive any warnings from the Turkish official at the place. After this incident, the diplomatic relationships between both countries started to crumble, especially when President Putin approved a body of “sanctions” to Turkey, like the diminishment in exportation products and the cancellation of all Russian tourists flights to Turkey in 2 weeks. US condemns assassination of Russian Amb to Turkey. Thoughts are w/his loved ones, Russian people, & other victims of this despicable act. Russia is a well-known ally of Bashar al-Assad regime while Turkey is with the NATO coalition against what they call “the Syrian dictatorship.” Turkey and its allies are working alongside Syrian rebels to topple al-Assad, and Moscow grants military forces to Syrian Government to combat the insurgent army. This month, the tension between both nations was at its lowest point since the plane incident in 2015. However, Russia has been subject of protests inside Turkey this week. The reason for the protesters is that the Russian Government is supporting Syrian President Bashar al-Assad along with the destruction of Aleppo, the Syrian city located in the north, near Turkey. According to the Ankara mayor, this Monday attack was aiming towards the destruction of the Moscow-Ankara oncoming diplomatic relationships. This Tuesday it was scheduled a meeting between the Turkish, Iranian and Russian Foreign Ministers in order to discuss the current situation in Syria and the mechanisms they should use to stabilize Aleppo. Russia, Turkey, and even the U.S. have been working together regarding the refugee crisis that Syria is living. The U.S. state department spokesman John Kirby condemned the attack on the Russian Ambassador this Monday. “We condemn this act of violence, whatever its source. Our thoughts and prayers are with him and his family,” Kirby stated in an official press conference. Other countries and diplomatic figures have shown their concerns. The French President Francois Hollande “strongly” condemned the attack; the British Foreign Secretary Boris Johnson stated that he was shocked and that these situations must be condemned as acts of “cowardice” and the German Interior Minister Thomas de Maiziere said that Germany would work with Turkey to combat this terrorist groups.